The Federation Trading Post didn’t last forever; today, a skyscraper stands in its place on 53rd Street. Eventually, it turned into a mail order catalog but ultimately went the way of, well, the mail order catalog. Although its time was finite, the Federation Trading Post had a huge impact on Trekkies of all ages. Chris Gilleece grew up in Brooklyn, watching Star Trek as it aired in syndication in the 1970s. He had the distinct pleasure of visiting the Trading Post, and below he shares his memory of the iconic store. In the 70s, when I was a kid growing up in Brooklyn, New York, Star Trek used to air at 6:00 p.m. Monday to Friday on WPIX TV, Channel 11. One night, right after the show, a 30-second commercial flashed across my TV set: there was now a retail store in New York City called The Federation Trading Post devoted to selling all things Star Trek. It was the first store of its kind. I couldn’t believe it. If you were a fan in the 70s, you knew how desperate we were for anything Star Trek, so having a store that sold nothing but stuff related to my beloved Star Trek was a dream come true. I went nuts and immediately ran to the next room to tell my Dad that I had to go there. SOON. The store was located at 210 East 53rd Street in Manhattan, a city block that, in those days, was a mix of businesses, restaurants, and residences. I was the first one out of the car. I ran up the open-iron type steps to a patio deck where I immediately spotted a large rendering of Spock with the Vulcan salute and the words “The Federation Trading Post” on the store’s front window. I opened the door and walked in, then reached an immediate state of euphoria as my 10-year-old eyes took in the various kinds of Star Trek merchandise on display. When my family came in behind me I could barely hear them making jokes about my current state of mind; I was transfixed. I flipped again when I saw the mini-musuem that was set-up inside the store. I was like an addict, getting the biggest Star Trek fix of all time. The museum room was lined with accurate reproductions of the control panels and transporter back-glass from the Enterprise, a Balok puppet head and a large scale model replica of a Klingon battlecruiser. There was a phaser displayed among some tribbles and other fan-made props like agonizers and hypo-sprays. They also had William Shatner’s first season green uniform tunic with rank braid on the shoulders. As I gazed upon all of these gems, recorded Star Trek sound effects played in the background on a loop. I had a tear in my eye, if I remember correctly. Now, at the behest of my family, I was asked to stop gazing at the museum and start shopping as this was going to be a long process. I delved deep: photographs of all sizes and types, posters, model kits, books, blueprints, key-chains (they used to carry a “Doomsday Machine” key-chain, which I have never seen since), tribbles, insignia patches, iron-ons, t-shirts, authentic reproductions of third season (polyester) uniform shirts in all colors and hand-made electronic phaser props. I was drooling at this point and was surprised that I wasn’t getting asked to leave for soaking the store’s carpet. I looked at what ever money I had with me and figured Dad would kick me a few bucks… but whatever money my pops would give me wouldn’t be enough to buy an accurate uniform shirt or a prop quality electronic phaser. If I remember correctly, the uniform shirts were going for around forty bucks a piece (over $200 in today’s money), and the beautiful phaser prop had an asking price of about $175.00 (around $1,000 in modern dollars), despite what it says on the photo. Both were kingly sums back in 1976. When I approached the counter to pay, I saw that the cashier had a Boa Constrictor snake wrapped around his neck! I thought it might be a baby Gorn or something. Turns out, he was one of the store’s owners and let me pet the snake and try the electronic prop phaser that was kept on a shelf behind him. I actually considered running out of the store with it, it was that beautiful. It was clear that this was now my Mecca, my favorite store on the planet. By now, my family had had enough of my drooling enthusiasm for this fantastic store and ushered me out, my mother explaining to me the economics of why I couldn’t get that official Kirk shirt (with a gold rank braid that was actually correct!) and that we would return again. And we did. My grandmother on my father’s side lived off Third Avenue, and so future treks to the Federation would be on the way! Excellent! Alas, my dream store faded away after I moved from Brooklyn to New Rochelle, NY. In 1977, The Federation Trading Post closed the doors of its Manhattan store. After that, The Federation Trading Post West opened in California and was strictly a mail-order catalogue business. I’m pretty sure the mail-order business has been defunct for years now. For all of you who were lucky to have had the experience of the Federation Trading Post, especially at that real “kid age,” you can relate to all of this. It really was a special place for us fans. For all of you who didn’t get a chance to visit this once upon a time midtown magic, I wish you could have! That’s a lot of Trek stuff. A simpler time to be a fan…..
It’s the thing that’s missing in fandom now. I’m not a Trekkie who likes to continuously look back at our past -when it comes to a lot of Trek news, merchandise, video releases, etc- while almost ignoring or groaning the future (I am, only 33) but it would be great to have a communal space again. The Vegas attraction was great for that and yes we have the big Vegas Con but it’d be great to have places on both sides of the country let alone outside of the country where Trek fans can gather and just be Trek fans. Maybe it’s time for another big theme attraction/location to pop up. and Ed Gross also mentioned this fine establishment. posters, Blueprints and “The Making of Star Trek” and the 2 David Gerrold Non Fiction books, plus the Allen Dean Foster Trek Animated novelizations. retailers did their best to keep replenishing their stock. Bought me a tribble there when I was 13. I remember the big Klingon ship in there too. Been a long time. Likewise, Orlando had a big store called Enterprise 1701 that was open all through the 1990s but closed sometime in the early 21st century. But seriously, even though we disagreed just as much back then, we were much too tired from physically schlepping (trekking?) around to do what we now can sitting in our pajamas barely getting out of bed, to keep a good row going for long. I remember the Federation Trading Post in Berkeley around 1976. They used to advertise it on the old Creature Features show with Bob Wilkins. I always wanted to visit it but I was too young to travel to Berkeley by myself. By the time I was old enough to visit their new store in San Francisco, Star Wars had come out and half the merchandise was for Star Wars. It looks like they had one in Berkeley, New York and then San Francisco. I remember the Berkeley location also. I had moved to California (near San Francisco) in the later 1970s, and remember visiting it a couple of times while it was still there. Not sure when they closed up shop, but one distinct memory I retain is in regards to an actual, coin-operated Star Trek video game that was there. It featured the Enterprise and a Klingon ship that did battle, and even had a Romulan ship that would appear randomly to attack you. And the best part was that, when the game was over and one of the ships was defeated, the loser’s ship was swallowed up by the Doomsday Machine! I also remember the Federation Trading Post on Telegraph Avenue in Berkeley. I remember seeing the Star Wars teaser poster there a few months before the movie came out. I still have a number of the posters and other items I bought there in the last ’70s. It was definitely not mail-order only. I don’t know when it closed, but I do know that a company I worked for had their offices in the same location in the mid- to late- ’80s, so I think it must have closed some time between ’83 and ’86. It’s funny to think about one of the biggest selling items they had at these stores — photographs. Pre-Internet, they would have books and books of stills, hundreds of 8×10 photos that you could buy for a dollar or two. Fans today have no idea how good they have it. My dad owned the Longley’s Coffee Shop on the corner of 52nd and Lexington (SW corner), and I used to run from there over to the Trading Post as often as I could as a kid once it was open. I also became a fan watching TOS in syndication weeknights on WPIX, and this was like having a daily Star Trek convention fix right in midtown Manhattan. I bought my Franz Joseph blueprints there, 2 tribbles from a big barrel of them in the store, a Nichelle Nichols 45 RPM single, ship models, books, and whatever else I could afford. I always needed more money! Thanks for the retrospective! I was too young and lived too far away to go to the Trading Post, but in the 90’s during Trek’s second resurgence we had a nifty little store called The Continuum that was nothing but Trek. A glorious place that I frequented in my late 20’s and early 30’s. Before the internet. Before the Dark Times….. Anyway, that store and the yearly local Star Trek conventions that featured many of the past and then current stars were like dreams come true. And then The Experience in Vegas just took everything up a dozen notches. Alas, the store closed, the conventions ran their course to never be seen again in these parts, The Experience shut down, and the Vegas con is outrageously expensive. Agreed on the Vegas Con. And ugh, it’s in Vegas. I wish there were little Trek collectives around the country. I’m not a joiner, so the Starfleet Club is out for me, but it’d be awfully nice to be able to go to a small, reasonable Trek space. I don’t mind Vegas so much but I see no point in going to the overpriced convention there without the benefit of The Experience. I mean, yeah, Vegas is kind of a big phony hole but at least I can find something good to eat. But in my line of work I am in Vegas plenty and it get’s old real quick. I also don’t get as much out of seeing the stars in a big hall talk about old times. I enjoy the dealer room more where I can buy stuff. But I would do that then I would go hang out at Quark’s or pay to go on one of the rides or shell out a little more money to hang out on the D’s bridge for 15 minutes. I’ve heard and read a lot about this place and time. I was alive then but just a kid and many miles away from NY. Would have loved to have been there. It’s exactly the kind of thing I craved then. There was a hobby shop in our town that had a set of blueprints of the Enterprise. In 1976 the guy wanted $300.00 for them and would only let you look at them through the glass. I’ve always wondered what became of them. Did he ever sell them at that price? I loved this article. The Trading Post was before my time, but I can imagine what visiting it must have been like! Would be interested to hear from the folks who founded the shop. Seems like a crazy idea for an NYC business in the nascent days of fandom. I used to go there on the weekend and listen to the Trek episodes on tape — after spending caddy money on merchandise. They had a modeling contest and I entered my Enterprise. I didn’t win, but I remember the owner (had to be Doug Drexler) very nicely explaining why the winner did win. He was right and I knew it then. Still have the kit and FTP certificate of appreciation for entering. The Kirk shirt was screen used real and loaned by a Trek book writer/collector. I’m pretty sure I asked then. Great store and also remembering passing it on my first visit, because I expected to find some kind of huge place with racks of uniforms and boots(?). I walked back and found it– the store was off a balcony set back from the street in a kind of niche. Great place no matter what the size. My only regret is I walked in one day and they told me Gene Roddenberry had visited. Would have like to have seen that: the Star Trek creator in the Star Trek store. That article was a lot of fun. Thanks to the author for writing it. Stories like this make TrekMovie a unique destination. That article brought back memories; I’m pretty sure my brother and I bought a few things from them when they went mail order. There was a similar mail order store down in Florida – it’s name escapes me right now – that we bought a lot of stuff from back in the 1980s. There was no internet so we only found out about stores like this thru commercials and ads in magazines like Starlog or Toy Shop. Communication and purchases were done by mail or, if you were lucky, telephone. Still, scoring that rare collectible back then yielded a rush that’s seldom experienced today; the hunt to track down that rare piece you’d only heard about and didn’t even have a picture of was almost as much fun as finally finding it. We had a place similar to this in Fort Lauderdale, Fl, when I lived there in the eighties. Starship Enterprises. I came to know the owner very well, as it was one of my favorite places to hang out. Gods, Leonard and Nichelle look so young. . .
A legend, thought it never really existed. Pictures! Proof! I grew up in Canada and NYC was a world away. I think people attached to this establishment came to Toronto, with the props, etc. I held a phaser and communicator and I thought I could die right there. And a BIG thank you to WPIX, NY NY, Channel 11. Because of that station, my love for Trek was born through repeated viewings of TOS reruns in the 70’s. Classic. Great article. Ours was KXTX TV 39 out of Dallas. It was Batman, Star Trek and then Hogan Heroes. A nightly tradition after school and during dinner. Such fond memories. “Star Trek” on Channel 11 WPIX from NY…WOW !!!! What a run ! In the 70’s, it ran 7 days a week. Every night at 6:00pm and on Sunday 7:00pm. I think they kept it on Saturday night’s at 6:00pm for many years in the 80’s if I’m remembering correctly. I think there devotion and other similar channels helped keep Trek alive until the Movies finally arrived in 1979. This is the thing that put all these stories in my head, and then got me into the Blish books, and to a convention and eventually to write for a ‘zine! When we got cable in Connecticut in the early 80s, I was finally able to join in on the famous WPIX-11 Star Trek experience. The episodes were cut then, of course, but it was great to see them. I remember when our Hartford Fox station, Channel 61, did one and only one complete and UNCUT run of TOS in the 80s. Don’t know how they managed that, but, in the days before the Columbia House videos, it was great to witness. So many people here have said “those were the simpler times” of being a Star Trek fan. They’re right. It’s true. This great article has brought up so much nostalgia. Even living on Long Island, I never heard about this store until now. They may have opened it after my dad retired and we moved out of state. What a wonderful haven for fans it must have been! Every weeknight, WPIX was on up in the finished attic where my brothers shared living space. I think WPIX picked it up for re-runs when it first went off NBC! For two years previously, I had been able to watch Trek on Thursday night (if Mom was feeling uncommonly generous and Dad was working on the sailboat) … Then it switched to Fridays at TEN!! Disaster! I would sneak out of bed and LISTEN to the show from the bottom of the stairs. And it was sort of all right, because if you take away the fabulous visuals, Trek was still like a radio drama. From the soundtrack you could tell when there was danger, or when Kirk was wooing some alien woman “to save the day.” Every TV Guide cover featuring Spock, Kirk and McCoy got pasted up on my bedroom walls. My brother, who introduced me to Trek in 1966 or ’67, and I would sit on the daybed and watch WPIX, rapt! I think it must have been on at 6:30, because we got up there right after our 5:30 dinner. Or we rushed through dinner to get there by 6:00. I read and re-read the Blish books. Wish I still had those (and Nimoy’s albums, which I also collected)! I remember writing off to Lincoln Enterprises, and getting my leaflet back. I was so excited, but couldn’t afford anything. “The Making of Star Trek” came out in 1970 (or ’69?) and I read that obsessively. The making of a Star Trek fan! Thanks for the memories, Chris! Which I forgot to say, the wonderful COLOR television was downstairs, but my bro and I watched in black and white upstairs, because our parents thought it was a silly show. Can you imagine?? I was old enough (14) in 1968 to stay up until 11 on Fridays to watch “Trek”‘s third season. Although mostly on the old TV in my parents’ basement. I even blew off a biology assignment (we were ordered to watch some special that ABC ran against “Trek” that night) to watch “Wink Of An Eye” in its first run. I was flunking the class, and the teacher didn’t like me, so what did I have to lose? WPIX ran “Trek” from September 1969, until the rights went exclusively to Sy-Fy in 1998. Thanks for posting this. Great memories from 70s NY when I was a kid. I also made the pilgramage from Brooklyn after nagging my dad to take me. I remember seeing Doug Drexler working on that huge Klingon ship in the back room of the store. I think I found out about the store from a Star Trek radio show that was hosted by Allan Asherman. It was on at an ungodly hour at night on Mondays if I recall. It made me sleep deprived the next day at school, but I never missed a show. I remember visiting this place when I went to the NYC Star Trek Conventions in the 1970s. Back then fan-created merchandise and the dealers rooms were awesome. Hell, the conventions of the 1970s were a much better experience than the commercialized autograph sessions that we get these days. Back in the day the conventions were run by fans for fans. The art displays, fan Q&A, films, showing episodes, all of it was quality compared to the commercialized crap we get now. By the ’90s, when I was stationed in CA, and TNG brought many new people to Star Trek fandom, Creation got bigger, and the cons began turning into, um, “cons” … but they did have great star line-ups. Everything was more expensive at a Creation Con. Still, it was great to mix with fellow Trekfans, however ephemerally. I loved those intimate little fan-run conventions, usually held at a local college or somesuch. One I went to in the early ’70s in Youngstown, Ohio was either free or very cheap (like $1 a day) and folks ran old sci-fi films on the school’s AV Dept. 16mm projector. I seem to recall somebody borrowed film prints of Outer Limits episodes from a local TV station, too. And as much as I loved Star Trek, it was OL that really blew me away. I attended most of the New York conventions from 1973 through ’81. I stopped then, as I felt I was getting too old; there were too many little kids there. The best ones were put on by what became known as “The Committee”, from 1972-76. Read the late Joan Winston’s book “The Making of the ‘Trek” conventions if you can; it’s a fun read. Living in Queens my mother would periodically relent to my incessant pestering and take me. Purchased posters and photos of the cast as I remember. (All we could really afford back then). Even called the store on occasion. Those kind folks would endure my enthusiastic but no doubt annoying questions with grace and endless patience. Good times. Enjoyed the article, and the memories. In the ’70s, there was a Star Trek “store-within-a-store” in downtown San Jose, CA. It was located on (I believe) S. 2nd Street, around the corner from Bob Sidebottom’s famous underground comix shop on San Fernando St. The front of the main store on S. 2nd (it had a name that I do not remember) was primarily mainstream comics, genre magazines, posters, etc., and in the back of this main store was a large (4 ft.long perhaps?) fan-made Enterprise 1701 hanging from the ceiling, and below it, a hexagonal portal to the ST shop, called I think Starbase One. I haunted that place regularly (both the “inner” and “outer” stores) during my film school days of the mid-70s. My old friend “kmart” may remember this place. Not ignoring you Vokar, but I made a long reply to this about 48hrs back and it never seemed to get through moderation. I’ll check back in another couple days and see if it shows up by then, else I try retyping it. No problem, pal. I was wondering if you had been there or remembered the place. Bob Sidebottom was a heck of a nice guy, as I recall. There’s a Facebook page dedicated to Sidebottom and his shop, and friends and family post there. I remember also Recycled Books across the street down at the corner, with a large sci-fi section. Those were pretty good days, weren’t they? What a great news article! I had never even heard of the Federation Trading Post until now. I was only acquainted with Majel’s “Lincoln Enterprises” mail order catalog. Loved the pictures. I would have flipped out if I’d seen the phaser props and Klingon battle cruise in that store. Thanks for the photos, too. Good stuff. I enjoyed reading this wonderful article! Thanks Chris! The golden days of Trek were about twenty years ago. NG, DS9, VOY, on TV. TOS crew still making movies. New books every month. Conventions. And tons and TONS of ‘Star Trek crap’ to buy. 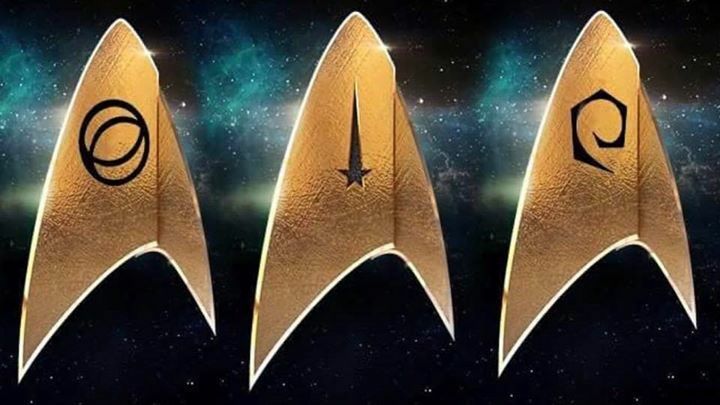 Was a great time to be a Trek fan. Why can’t we have that again? Oh, because they gave the movie franchise to someone who’s never had an original thought in his life and the tv show is going to be ‘women and minorities only’ Trek behind a paywall. This is exactly why we can’t have nice things. I used to drive to Vegas, stay at the Hilton and spend hours at the bar and restaurant (Quarks). I was saddened to see it taken away. On one visit to The Experience in Vegas we had one of our young ones in a stroller with her precious “Binky”. A Ferengi character asked us “Humons” what the function of that device was. I explained that it was a primitive form of a universal translator. After a hearty laugh, he gave me an miniature Star Trek Communicator Badge. Still proudly have it! Funny Star Trek is about the future and fans often look to its golden age in the past. Star Wars is about the past and fans are looking forward to its golden future. I hope Trek can recover, lots riding on the next couple years. FANTASTIC place. Miss it terribly. Missed the “uncostumed” Nimoy appearance by two days!! I remember going there when I was about 8 or 9, dragging my mom on one of our visits into the City from Jersey. I remember her standing there, arms crossed, waiting for me to buy something, and me just too overwhelmed to actually choose. Do I remember that they had a life size Nomad there? Or is it some vague constructed memory from my childhood? In any case, I too bought the insignia patches, some 35mm color slides, and I think I bought the AMT Tricorder/Communicator/Phaser model kit as well. If only I still had those things! This article is amazing. I was the same age and had the same experience with my first trip to the store. I grew up on Long Island, saw the commercials and begged for months! So just how long was the NYC Shop open? Months? A couple of years? I made a trip there with the entire family when I was about four or five years old. I don’t remember much but we did purchase an important family heirloom which we still have today!